Many have commented on the how, who, what and ethical implications following Maria Sharapova’s shock revelation of her failed drugs test. Few have looked in more depth at the why. The evidence for “why?” in this case falls in to two key areas. First is the evidence that Mildronate (or Meldonium as it is also known, unbeknownst to Maria [and her team] it appears) is indicated for the conditions Maria was taking it for, apparently to “combat a magnesium deficiency, heart problems and because of a family history of diabetes”. This must be some sort of “wonder drug” that her family doctor prescribed for her (when 17) to continue playing, despite these conditions. Meldonium’s Wikipedia page provides background information on the drug, such as common trade names (“Vazonat”, “Idrinol”, “Msmall”, “Quaterine”, “MET-88”, and “THP”), its chemical name (trimethylhydrasine), one of its Latvian manufacturers, Grindeks, and it’s widely adopted use throughout Latvia and other Baltic states. It isn’t licensed in the United States or Europe. A number of clinical trials are cited, unfortunately the links to each of these are dead but they all appear to be conference proceedings. The webpage does not provide enough detail to ascertain if the study was published in a peer-reviewed journal nor if the protocol was pre-registered. However, a bit of digging around the website and it appears they do provide a publication for this study in the journal Seminars in Cardiovascular Medicine. A double-blind, placebo-controlled trial in 371 chronic CHD patients with stable angina aged between 24 and 82 yrs of age (mean ~61 yrs) was performed to assess the effect of 12 months treatment with mildronate on exercise capacity as primary outcome (so not angina onset). In the 278 that completed the study (no details given for drop outs), patients randomized to Mildronate improved performance on a cycling ergometer test by an average of 55 seconds. But the study wasn’t great. Assessment of the risk of bias indicates problems, with a severe lack of reporting methods for sequence generation, allocation concealment and blinding. It only takes a quick check to realize that reporting doesn’t stand up well to CONSORT – for example, there is no statistical analysis section. Therefore, the findings from this paper would be classed at high risk of bias for their internal validity, and would question whether they could be applied to practice. There appears to be no pre-registered protocol although reporting bias based on methods described in the paper appears low. Adverse effects were not considered as an outcome nor were any reported. No information on funding is given and no conflicts of interest are stated. The study lead author and one of it’s principal investigators are Editors for the journal in which it was published. But I’ve just committed one of the sins of a non-EBM approach – cherry-picking (2nd definition in link). Perhaps you want a more systematic approach? A search of PubMed for “Mildronate” OR “Meldonium” gives 217 returns, 108 of which are in Russian. Filtering for systematic reviews in humans – which would give the highest level of evidence for the efficacy and effectiveness as a treatment for these conditions – gives zero returns. 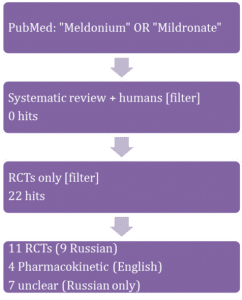 Filtering for the next level of evidence (RCTs) and only for Mildronate/Meldonium or its drug class gives 22 hits (Figure 1); 11 of which are RCTs (9 in Russian), 4 pharmacokinetic studies (all in English) and 7 studies (all in Russian) where study design/methods are unclear. Studies were published between 1989 and 2015. The study already looked at in detail on the manufacturer website was not picked up in the search. First thing of note is that there are a number of RCTs assessing the efficacy of Mildronate/Meldonium but no systematic review. Ascertaining details from each of the 11 RCTs is limited by language restrictions. It appears the largest included 512 patients and the smallest only 35. 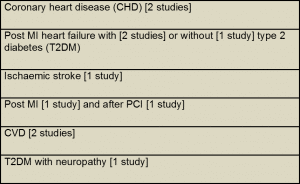 Clinical conditions assessed in each trial are listed in Figure 2. None of the studies assess patients with ECG abnormalities specifically (although these will be indicated in a number of the patient groups), nor pre-diabetes or magnesium deficiency, nor in adolescents! A second trial abstract (with only 2 authors) reports that 12 weeks Mildronate (no information on delivery or dose) “decreased the number of epinventricular extrasystoles (p = 0.002) and the number of paroxysmal rhythm disturbances (p = 0.001)” in 67 myocardial infarction survivors aged 40 to 70 years of age. It’s not possible to assess the risk of bias, the source of funding or conflicts of interest for these trials. Neither trial was pre-registered. Taking a leap of faith let’s assume these trials are at low risk of bias/no conflict of interest etc., they suggest that short-term (intravenous) use of Mildronate may reduce the frequency of ECG abnormalities in people aged 40 to 75 years of age and suffering from CHD or having survived a MI. But they are far too small to be anywhere near conclusive. A lack of information on delivery mode in one trial impacts on external validity as it is sold to be taken either orally or intravenously. So what about ‘indicators for diabetes’? One trial reports “a statistically significant improvement in renal functioning: GFS [glomerular filtration rate] increased by 20% vs 2% (p < 0.05); proportion of patients with exhausted FRR [function renal reserve] decreased (p < 0.05)” and “A hypoglycemizing ability of Mildronate was noted” in 30 patients aged 43 to 70 with heart failure and T2DM randomised to 1 g/day Mildronate (no information on delivery mode) for 16 weeks. A second open label trial by the same group found “Mildronate administration improved clinical condition of the study group vs controls by neuropathy and symptoms count scales.” in 70 patients with T2DM & neuropathy randomised to 1 g/day for 12 weeks. Again, it’s not possible to assess bias and potential conflicts of interest. External validity would appear poor given the patient population and no data on glycaemic control! Evidence for Mildronate/Meldonium in magnesium deficiency is easy – there isn’t any! However, cardiac arrhythmia may be a symptom of a magnesium abnormality (too much or too little) that provides a (albeit poor) mechanistic link for Mildronate/Meldonium use. Overall then there is some evidence from a few small RCTs that short-term use of Mildronate/Meldomium at 1g/day (intravenously but possibly orally) reduces occurrence of cardiac arrhythmia in high risk (older) patients with CHD. It may also improve renal function in heart failure patients with T2DM and neuropathy symptoms in T2DM. However, the trials providing this “evidence” are very likely too small and there is high uncertainty about the risk of bias, the quality of the data, conflicts of interest and a lack of data on potential harms. I know what I would say if I was on the jury. And it wouldn’t be ‘out‘ for long! My next blog will look at the evidence for Mildronate/Meldonium as a performance-enhancing substance. The views expressed are those of the authors and not necessarily of the any of the institutions mentioned in the article. 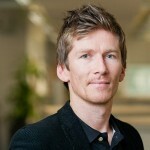 David Nunan is co-facilitating an Introduction to Evidence-Based Medicine Workshop as part of Evidence Live 2016. On Tuesday 21st June 2016 we are running a number of pre-conference workshops at a speacial rate of £155 each. Course fees include catering and course materials. Workshops will run at several venues in and around the Radcliffe Observatory Quarter. Very informative. When will you publish part 2? From what I’m hearing evidence is very slim regarding it being an effective PED. Part 2 is coming this week!